This is a beautiful 7 bedrooms / 5 full and 2 half bathrooms. The home is perfectly located in the quiet gated community of Cumbrian Lakes. 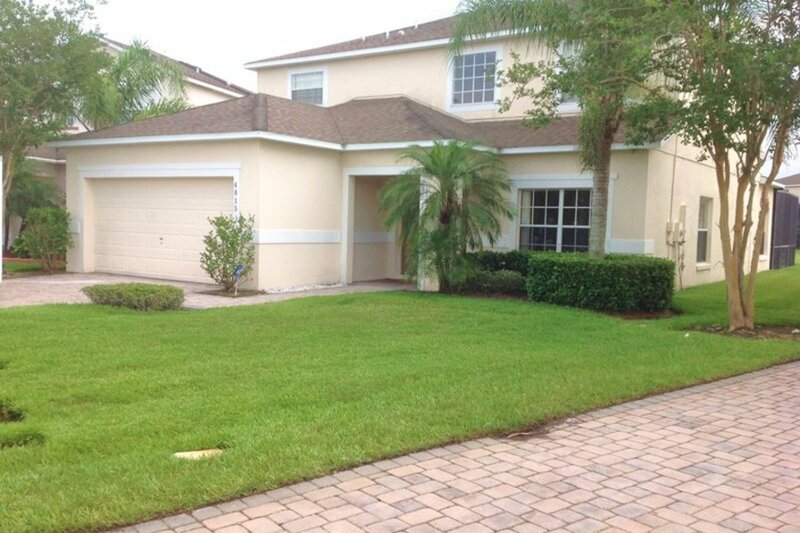 The home has a fabulous view of one of the lakes in the community which is south facing. This house has just been upgraded with all new furniture and has plenty of room to sleep for 16 people. The bedding includes 3 king size bedding, 1 queen size that all have their own bathrooms. The three twin beds share two bathrooms. Twin bedding are all decorated with Disney theme. All rooms have new flat screen LED T.V. 28-32 inch. They all have cable in each room and DVD player in the bigger rooms. The living room has a leather couch and love seat with a 55 inch Led T.V. with close to 1000 channels availability. The pool area has a spa attached to it and has a pool heater for a small extra charge. It has plenty of space to sit and take the sun on those fabulous Florida sunny days. The pool area is also enclose with a lanai to keep any small intruders away. I also have a 4 bedroom and 3 washroom home on Rental System #130136 and you may also look at the reviews for reference. Cumbrian Lakes is conveniently located four miles down Poinciana Boulevard from the 192 in Kissimmee, about 10 minutes from Disney. A brand new executive gated community set in a conservation area of 120 acres with lovely lakes, providing a haven for wildlife. Beautiful landscaping surrounds the homes and there is a nature trail around one of the lakes together with a communal children's play area. Whilst the community provides a safe, quiet location in which to relax after a busy day at the theme parks there are numerous shops and restaurants including a large twenty four hour Wal-Mart within five minutes drive on the 192. Cumbrian Lakes offers a sense of peace and harmony with nature, with open streets lined with ancient oak tree preserves (many with hanging moss) providing welcome shade and a taste of Florida's natural beauty. Sparkling lakes provide a hospitable habitat for cranes, ospreys, and blue heron. Pool heat is available with a small charge per week.